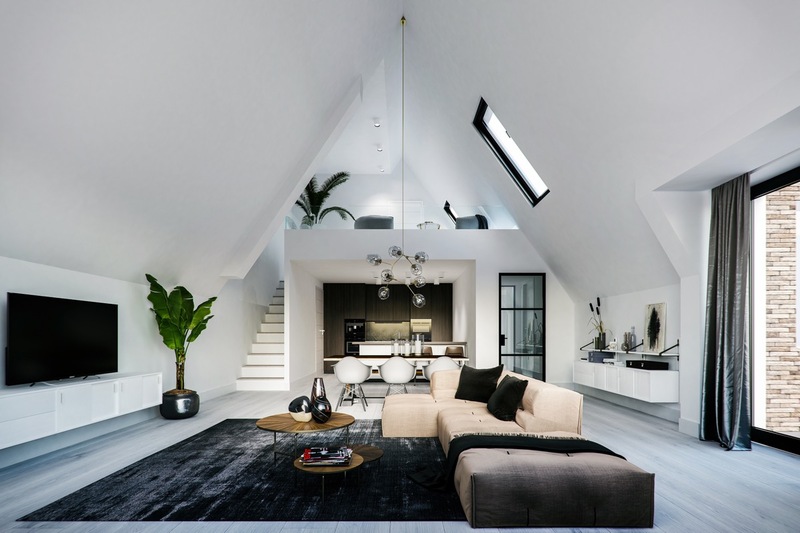 Skylights can completely change the feel of a room. 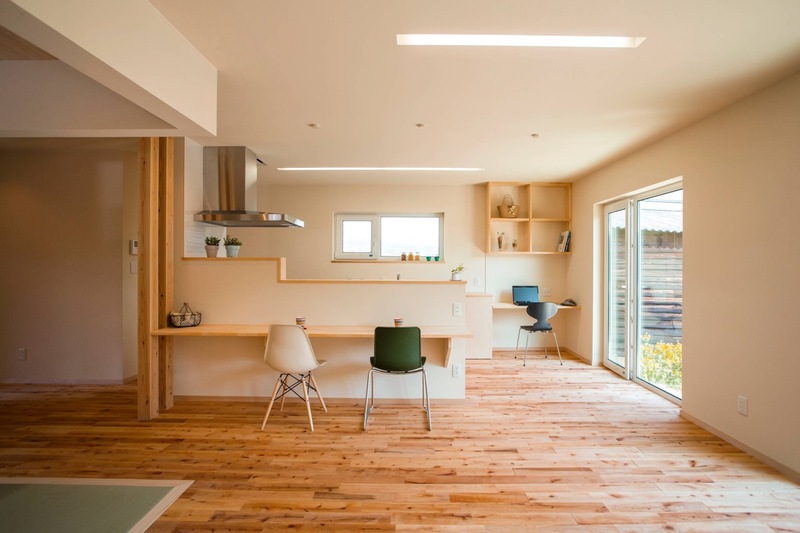 They don’t just let in more natural light, they also create a much more open feeling of space. 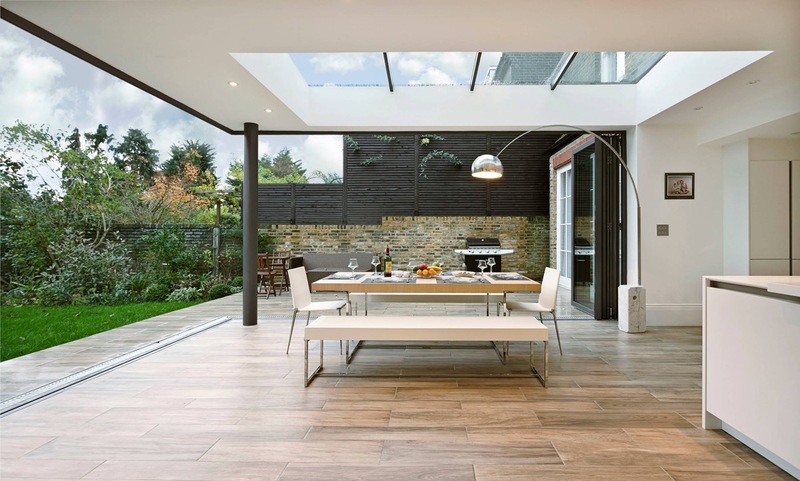 By adding glass to a low ceiling you can make it feel higher, seeing the sky through a high ceiling gives it the illusion of being part of an outdoor space. 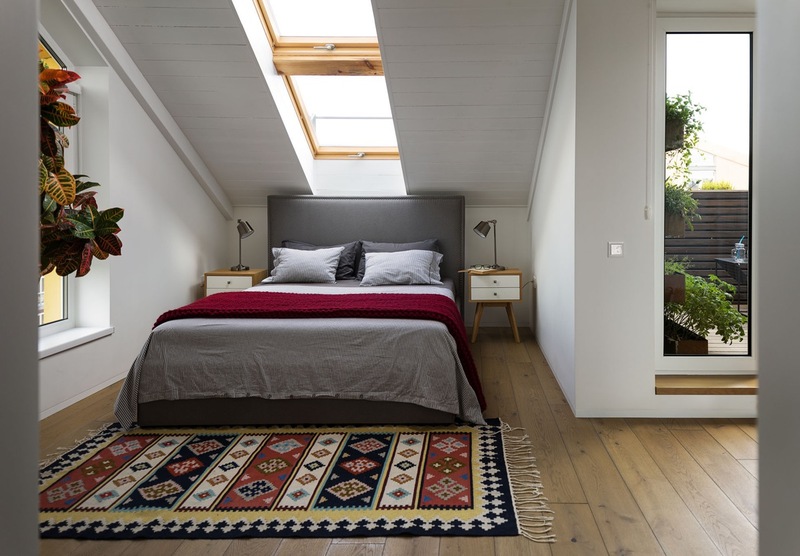 A window above your bed allows you to gaze at the stars or passing clouds, and one above a dining room could have you eating beneath the trees. 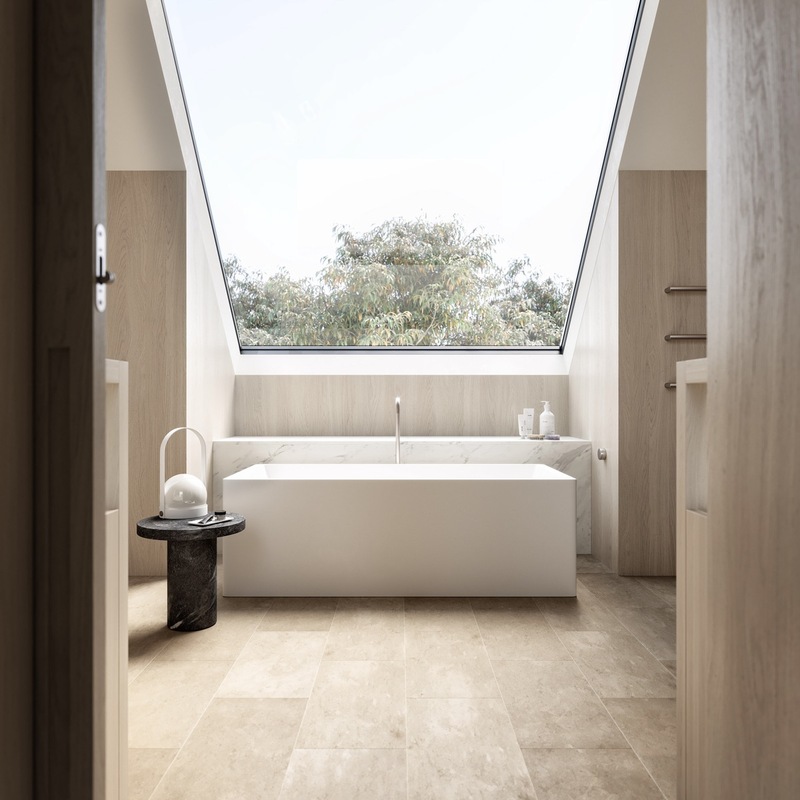 There are tons of ways in which to enjoy a skylight into your home, and we’ve put together an inspirational gallery with 37 of our most favourite installations. Everything feels more zen under the sun and trees. 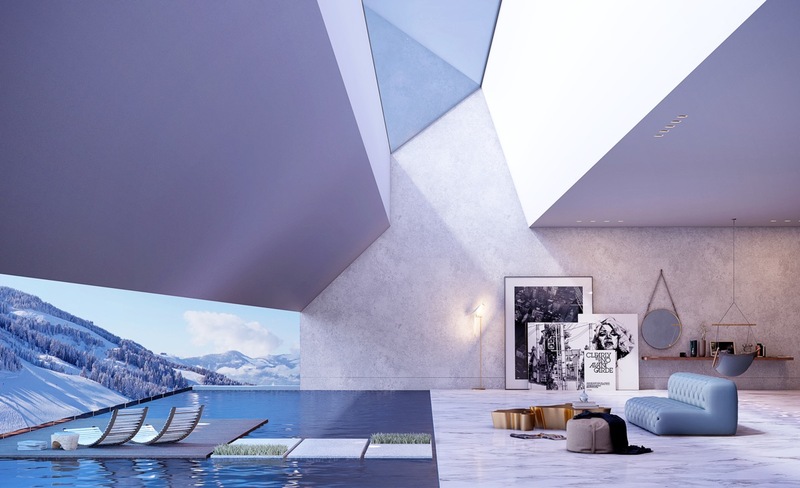 This skylight design folds around from flat roof top position into a vertical window. 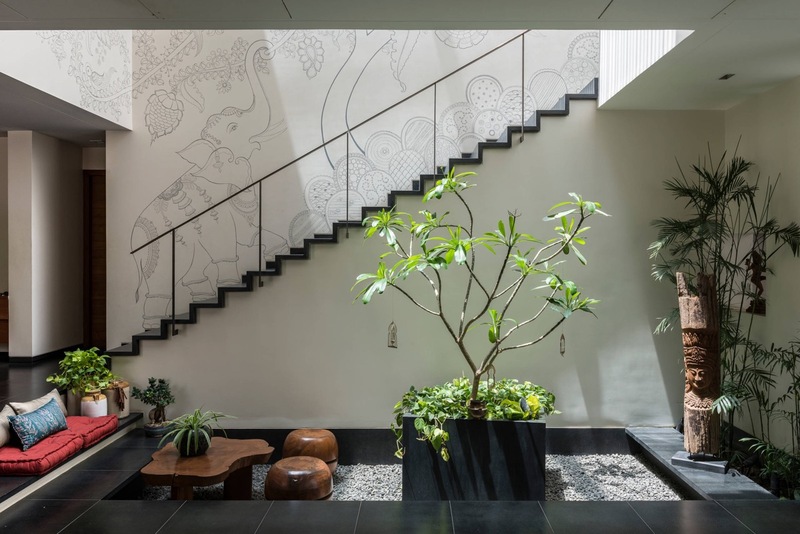 The continuous cutout of the wall into the roofline opens up a seamless view of the trees and their overhanging branches. 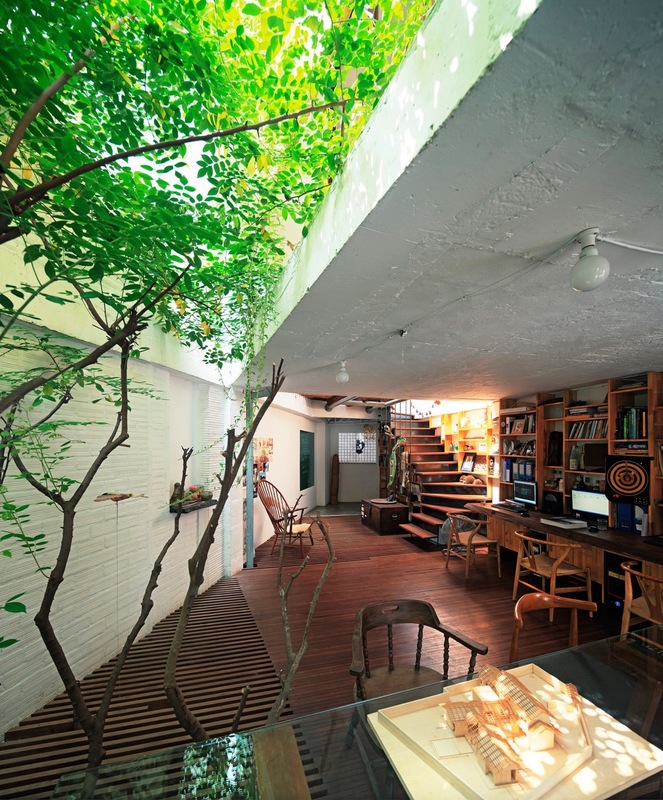 It’s not just us humans that thrive in the sunshine, indoor plants will flourish under a well placed skylight. Just be careful that their new growth won’t completely block out your share of the light too. 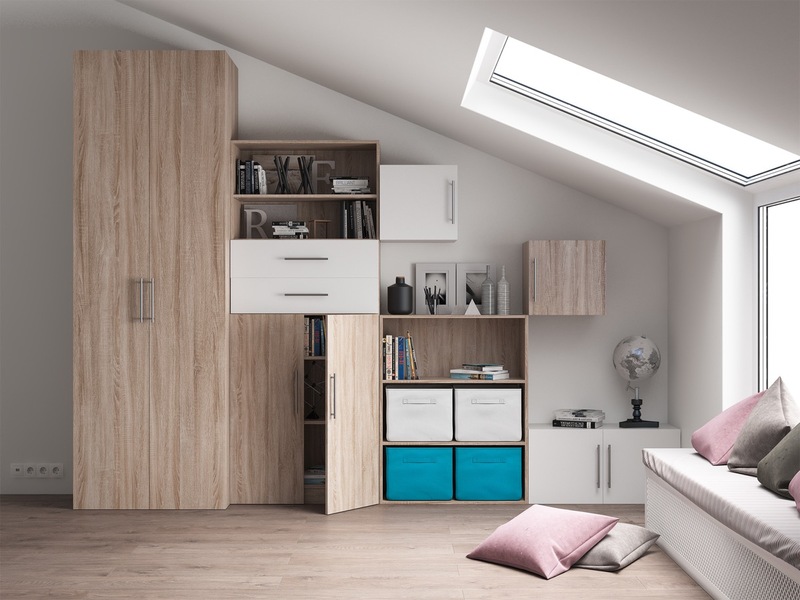 Rooflights can present the possibility of opening up a modern living room into loft space to create a mezzanine level – adding a whole heap more of square footage to your home. 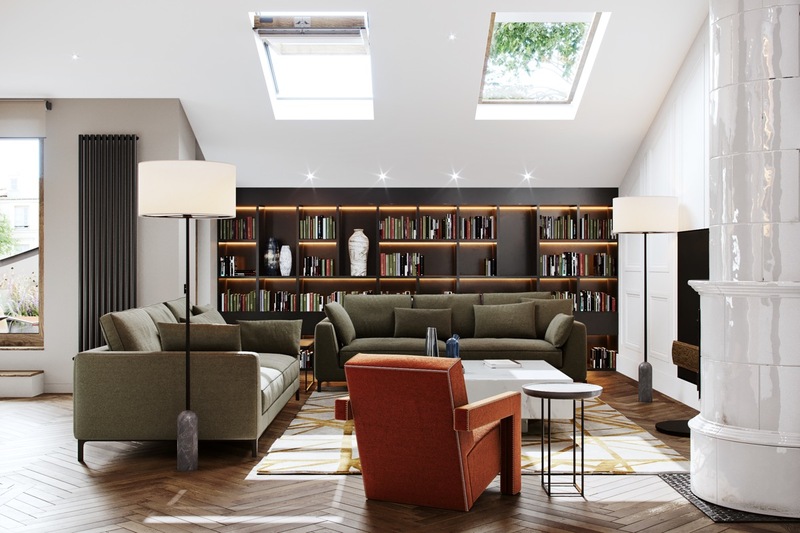 Skylights really finish off the airy look of a white walled contemporary living room, and can completely replace conventional windows in order to acquire more wall space for furniture or bookcases. 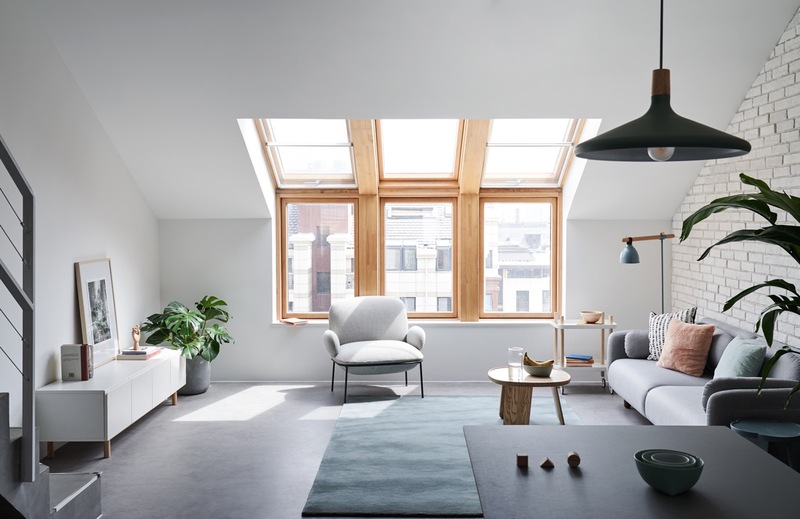 A single skylight can be enough to pleasantly light the shadowy end of an extremely long room. 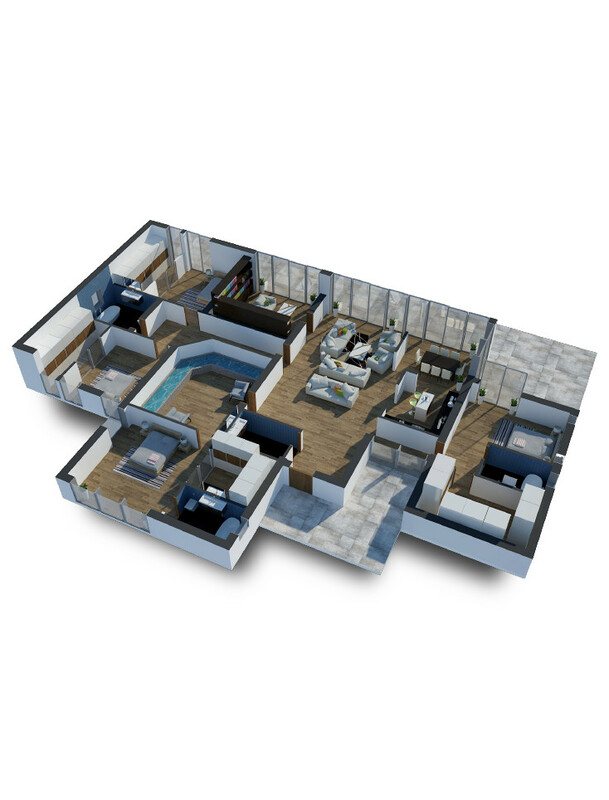 Even if a room already has a lot of windows, opening up the ceiling can still change the dynamics. 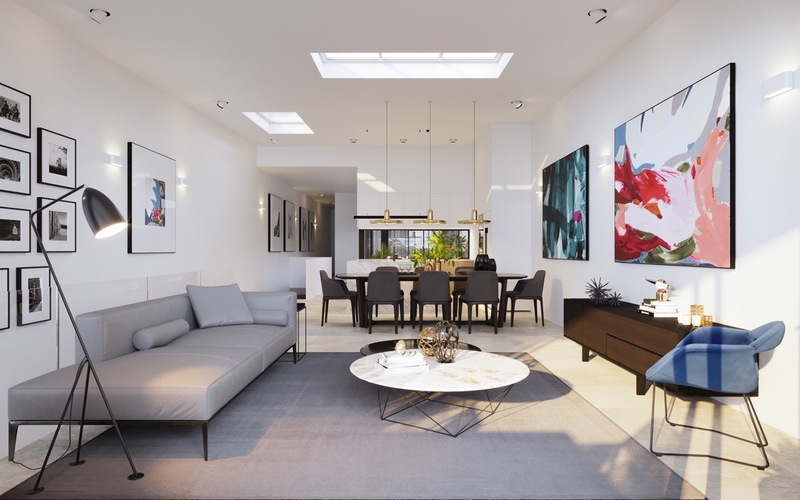 An octagonal roof lantern brings extra sunshine into the very centre of this yellow accent living room with dual aspect windows. 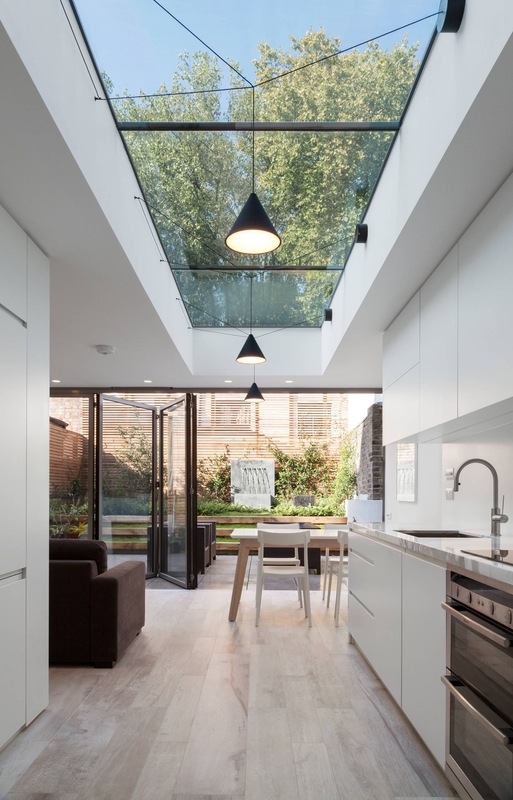 These flat roof skylights push light through a large an open plan room, casting sunny reflections over a glossy white kitchen all the way in the back. 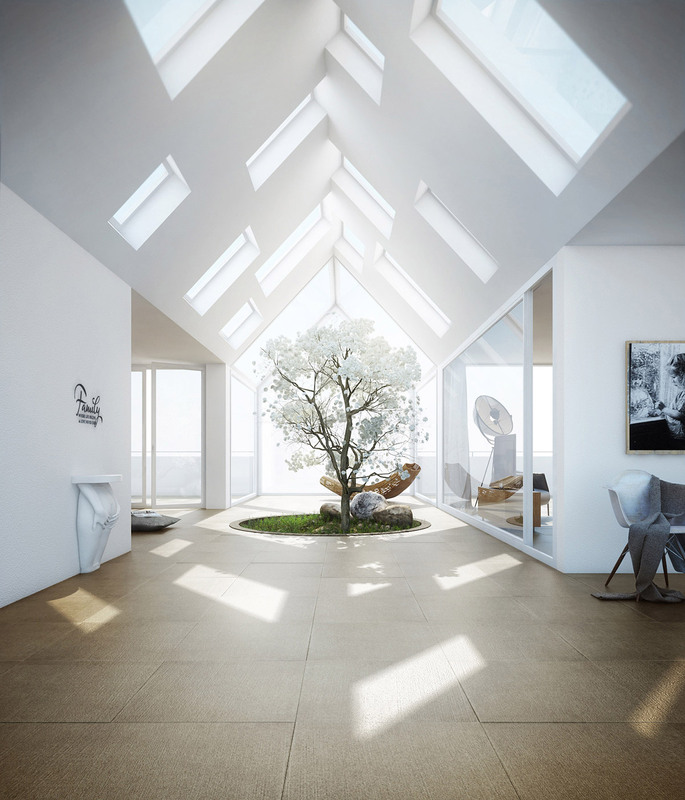 Increase daylight and view by combining roof elements with a conventional window line. 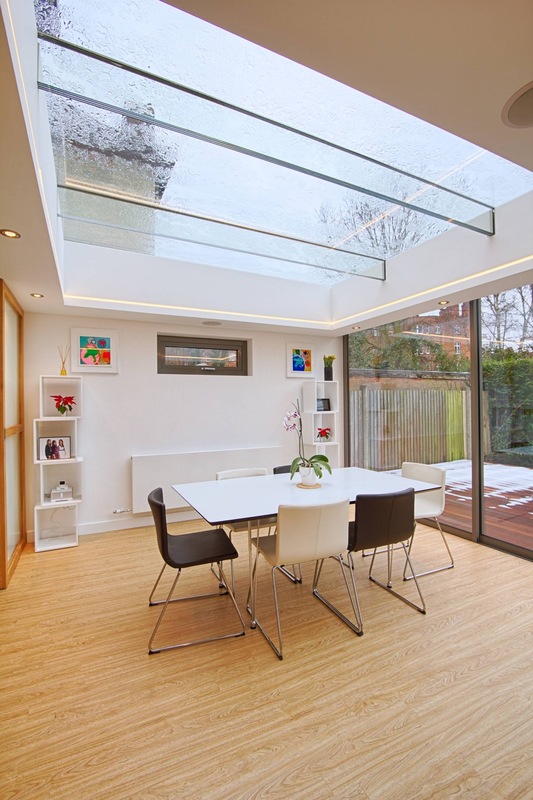 A rectangular roof lantern will flood a large room in natural light, all the way into its corners. The glazed lantern also makes a stunning architectural feature. 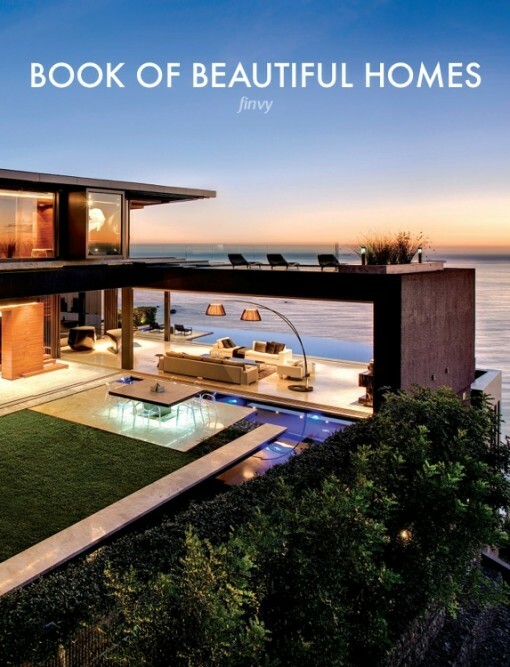 The dark wooden ceiling in this book lover’s living room draws special attention to the bright box of light overhead. 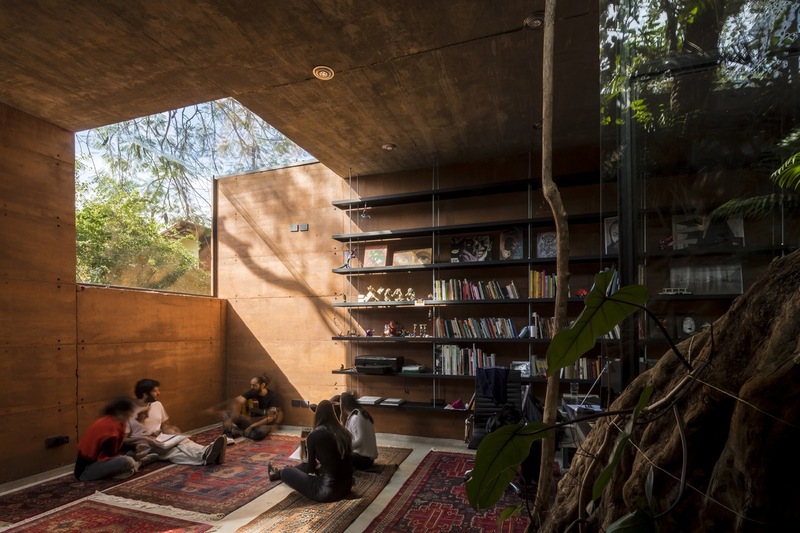 The added natural light is perfect for reading. Think in multiples for real wow factor. Change up the size, shape and positioning for a truly unique effect. 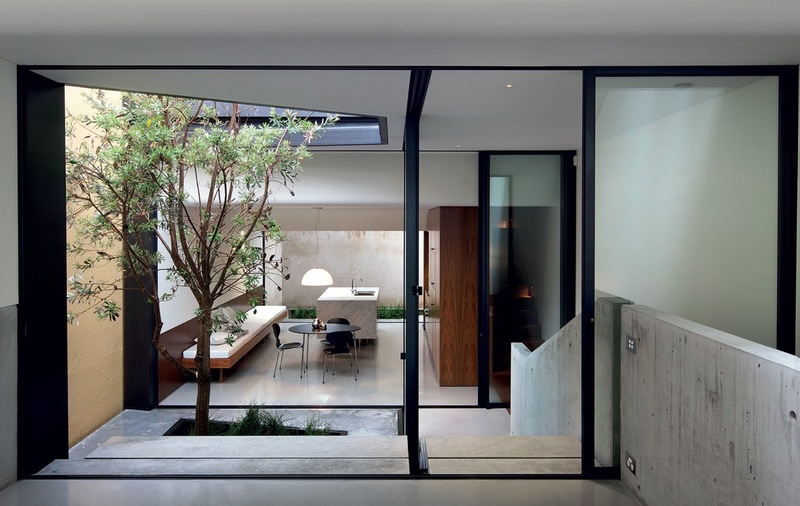 Light is an essential part of courtyard design. 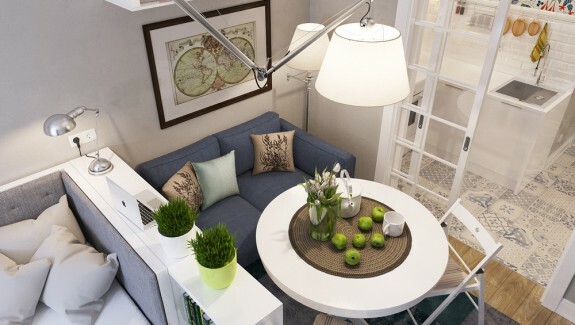 An overhead light source gives the perfect natural sunbeam effect. 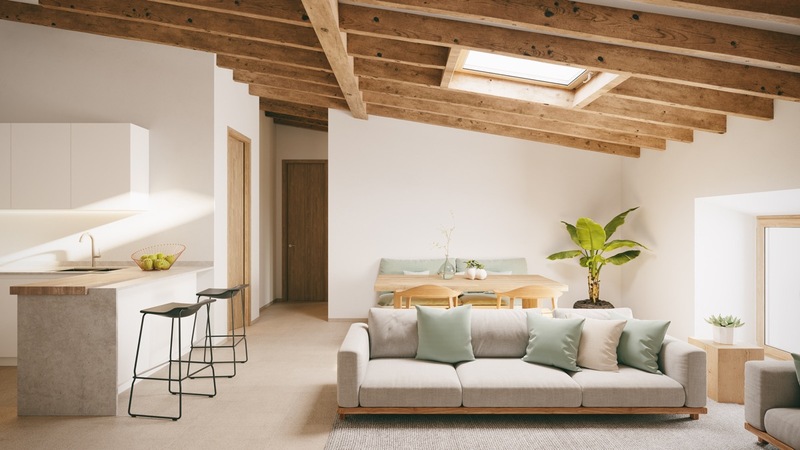 Chunky natural roof beams look beautiful for sure, but they can also feel a little heavy and close the room in. 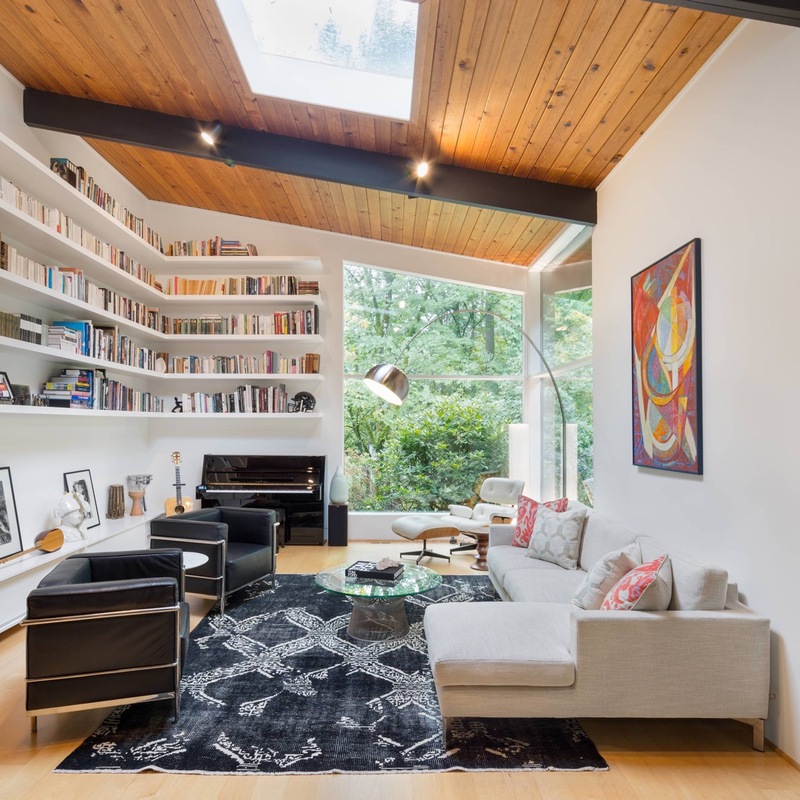 Removing part of the roof beams in favour of a skylight will lighten and brighten, and ultimately enrich the look. 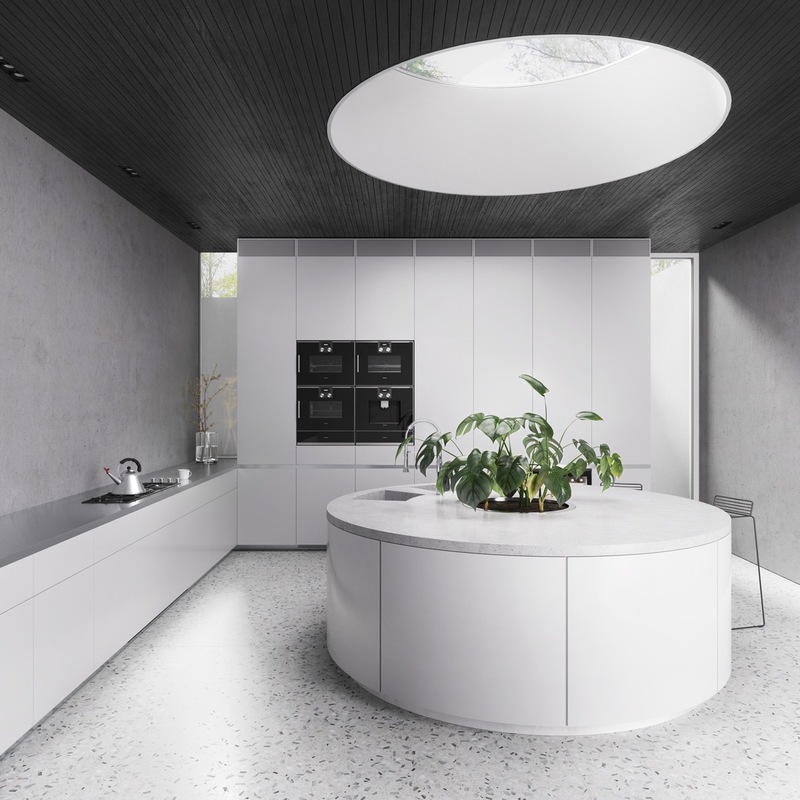 A linear skylight across a modern kitchen looks the business. Shadows get lighter, colours get brighter. 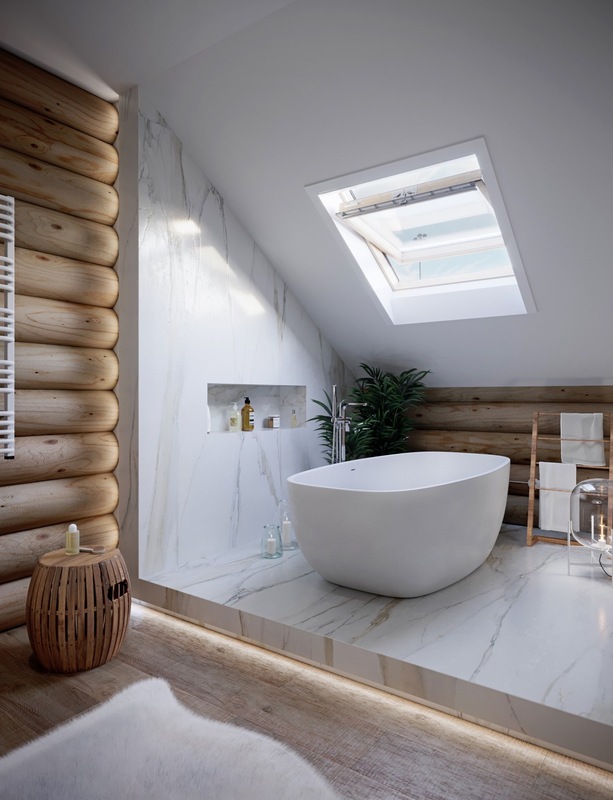 A skylight only makes a luxurious bathroom look even more luxurious. Edge to edge glass makes a ceiling completely disappear. 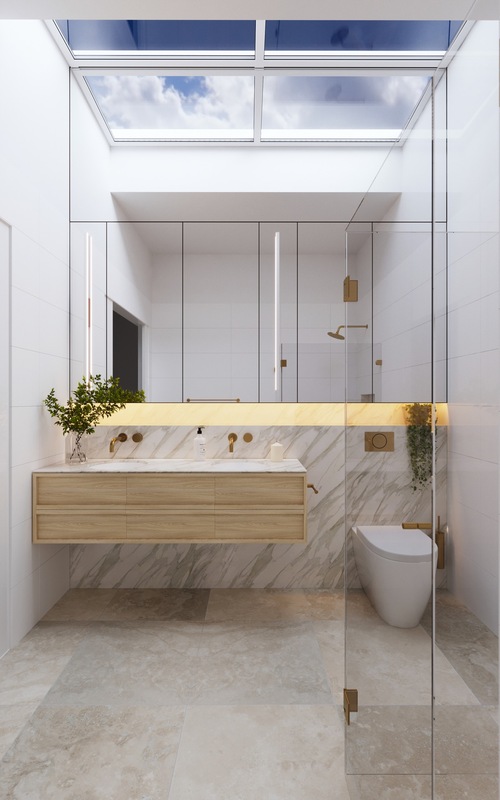 The effect of roof glass above this double sink bathroom vanity is doubled by a large vanity mirror. A huge expanse of roof glass is supported by glass struts above this modern dining room, to give a crystal clear result. Strip lights highlight the border of the installation. How about some stained glass to colour your day? 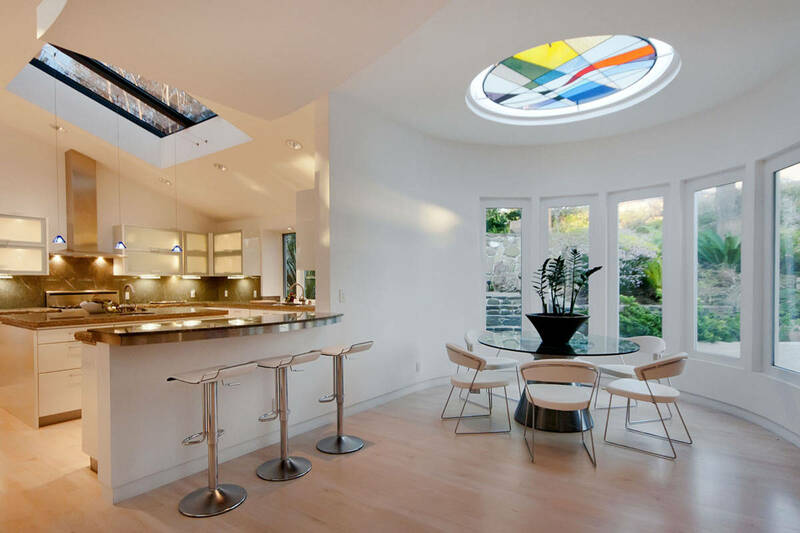 This round skylight echoes the shape of a circular island in a white kitchen below. 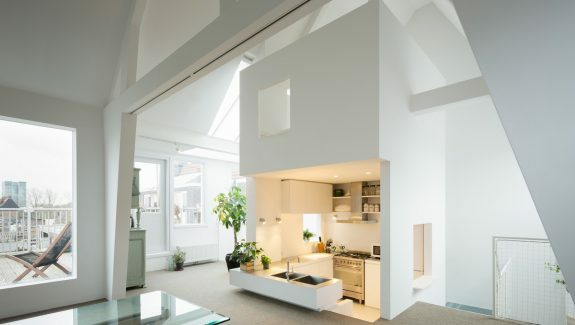 A flat skylight serves the full length of this modern kitchen/diner/lounge space. Pendant lights are strewn across the glass for nightfall. 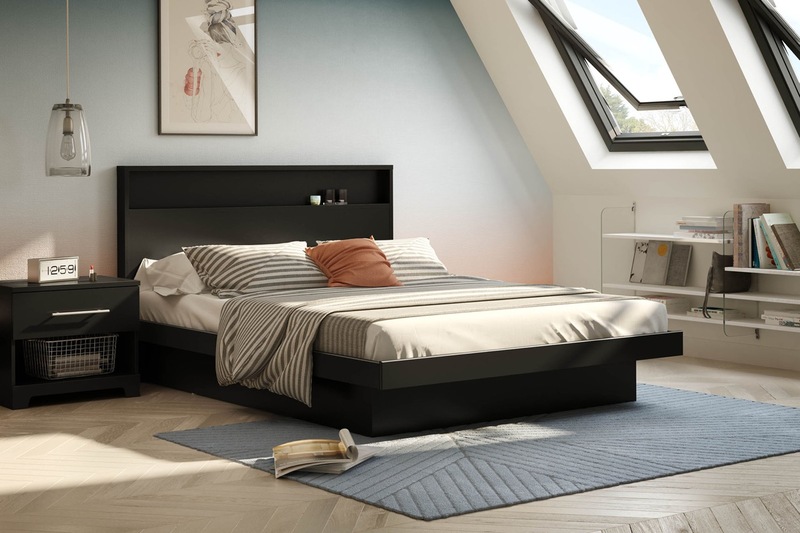 Combining several flat, sloped and vertical elements gives this plain white bedroom a massively dramatic look. 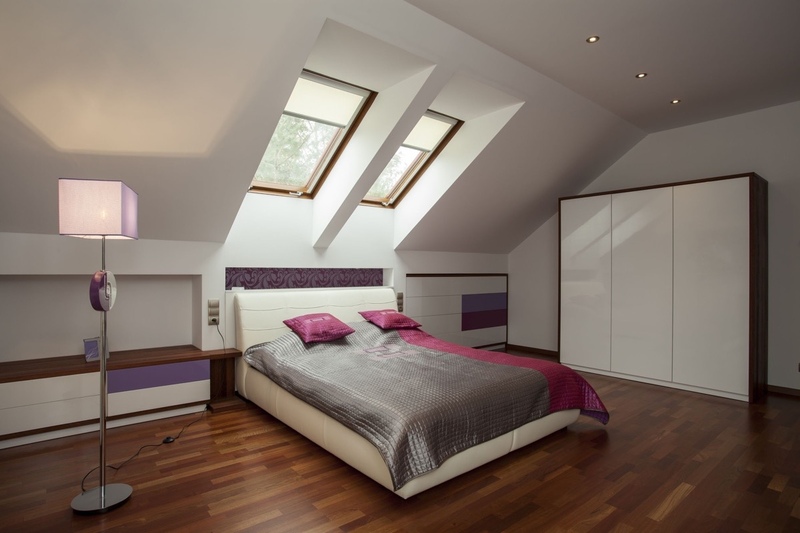 Position a roof cutaway flush against a wall, like this one along the headboard wall of a modern bedroom. This platform bed sleeps in a treetop breeze. 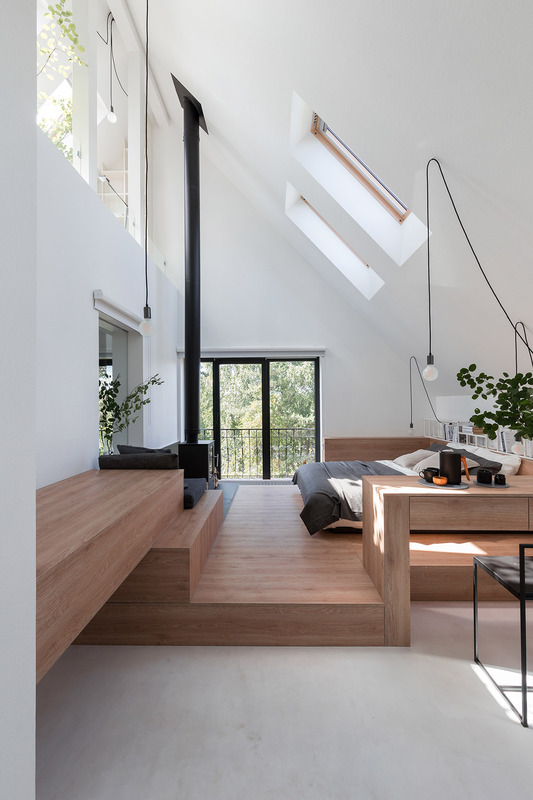 Another light filled mezzanine facilitated by skylights – but this time the extra level has been added to a bedroom. 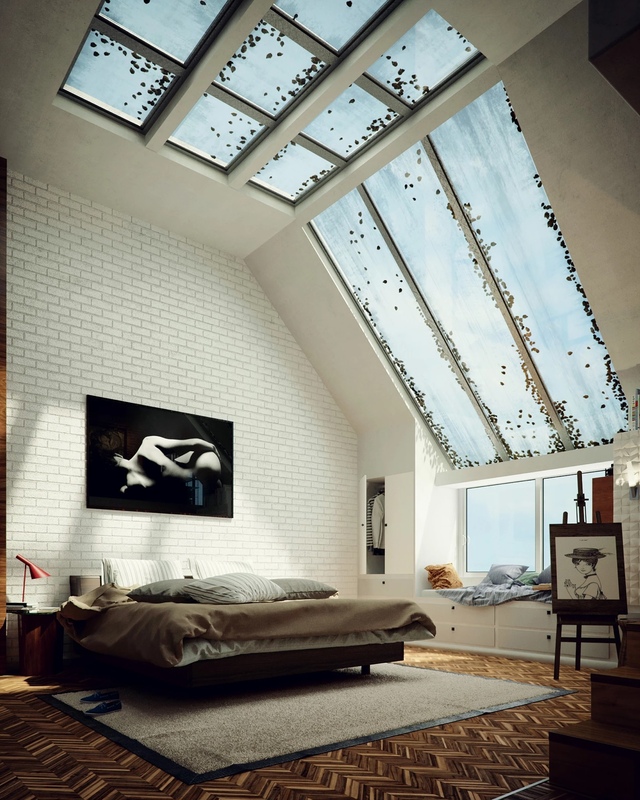 Rooflights are a must under the eaves. 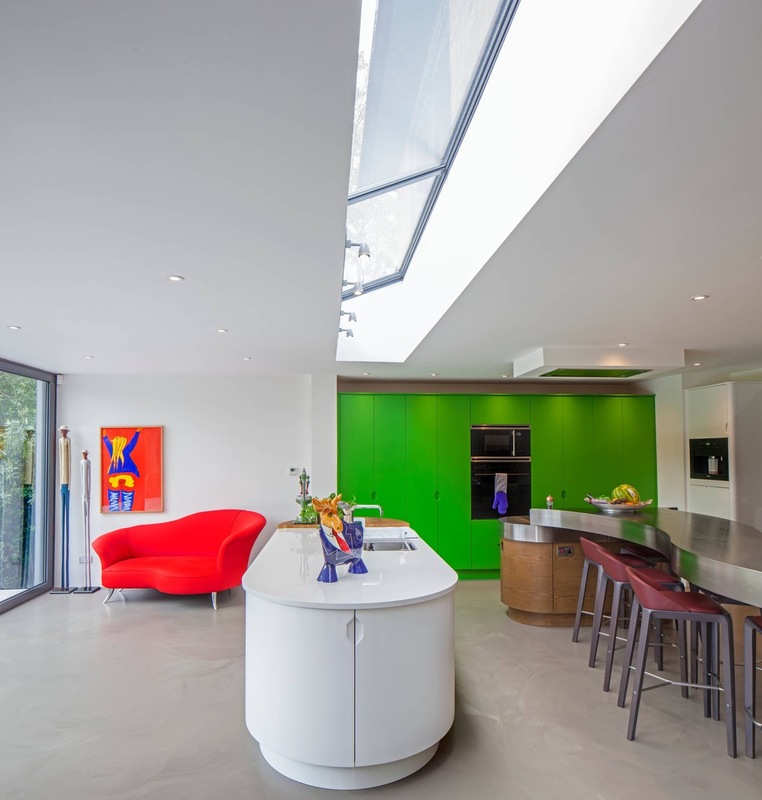 Double-bank velux windows to elongate the line of light. This kid’s bedroom scheme has a dreamy view of fluffy clouds – not just the cute cloud wall stickers – but real cloud formations floating overhead to watch and imagine shapes in. 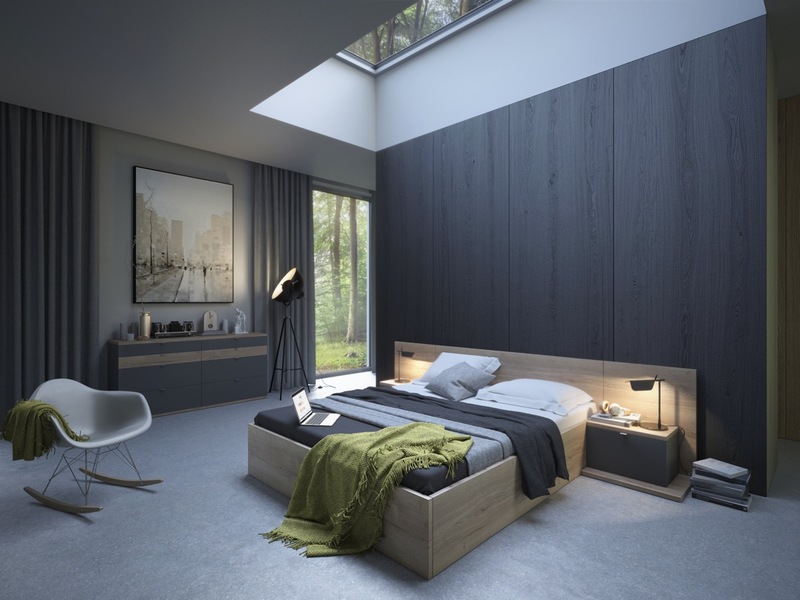 A dark bedroom benefits from an elongated cutaway of both ceiling and wall. Even narrow letterboxes of light can make all the difference in a shadowy space. 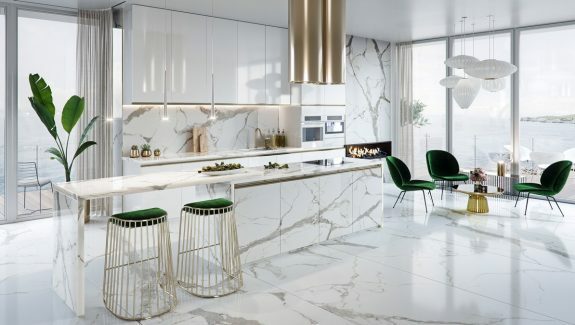 If you’re the type that likes to really stand out from the crowd, and have something in your home that no one else has, then you could commission a bespoke design that is tailored specifically to your space. 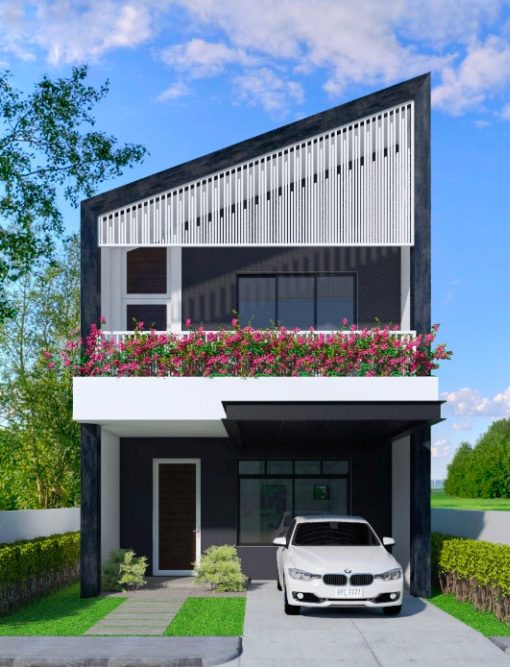 Take inspiration from the unique angular window design in this modern home office. 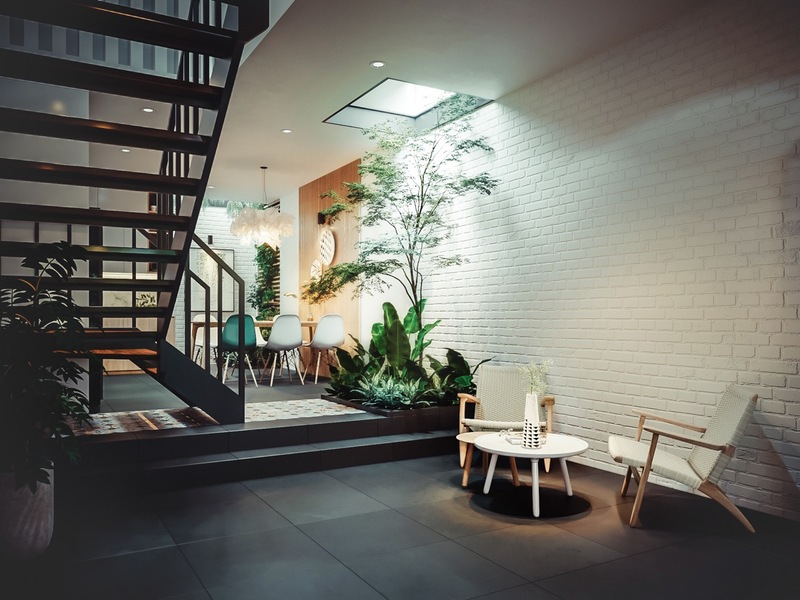 Basement levels enjoy light from above via light wells. 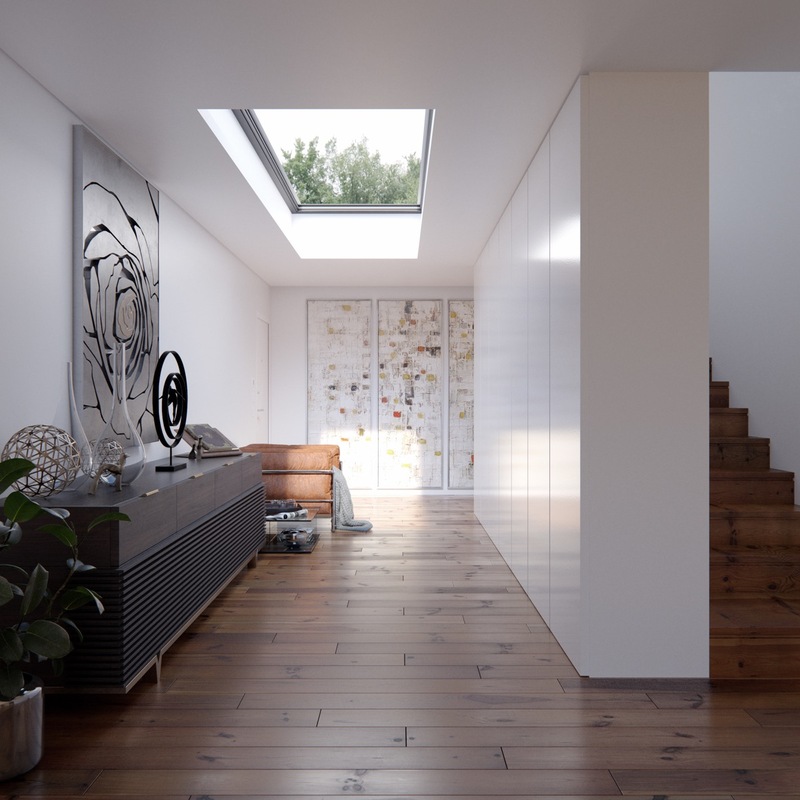 You can also send extra light flooding down the basement stairs by positioning a large skylight directly above it. 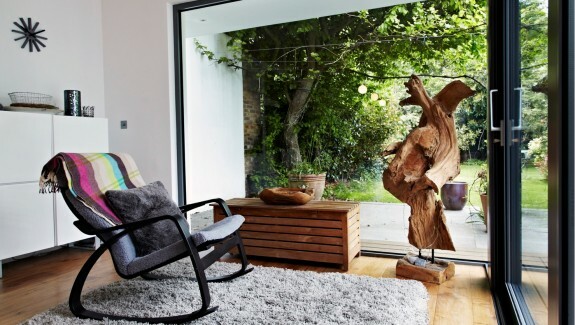 Draw attention to a downward light source by planting a tree in its beams. 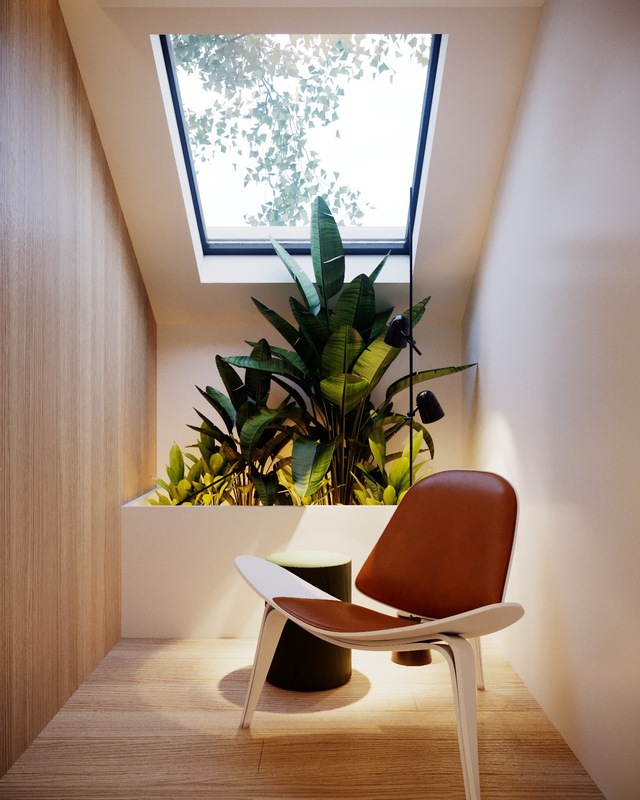 All different types of spaces can be transformed by a skylight, from a long dingy hallway…. … to the tiniest nook. Rooms with retractable doors blur the boundaries between indoors and out, but a glass roof really blows the space open to the great outdoors.